Every Saturday morning ritual should involve an early rise and a walk over to Cake and Loaf Bakery on the corner of Dundurn and Homewood. Cake and Loaf consistently puts out new baked goods and sweet treats using quality ingredients and mouthwatering recipes. It is Easter time at Cake and Loaf. Easter brings numerous sweet treats we’ve all known to expect. Everyone enjoys mini eggs, cream eggs, peeps, chocolate bunnies, chocolate coated marshmallows and any other pastel coloured candy their heart desires. Cake and Loaf has put out some of their Easter line that includes cream eggs, chocolate covered marshmallows, chocolate bars and cupcakes. The cream eggs are so good and are made with real cream centres. Cake and Loaf makes the best homemade marshmallows that come in original and coconut coated. The real show stopper marshmallows are these Mexican Hot Chocolate Marshmallows. 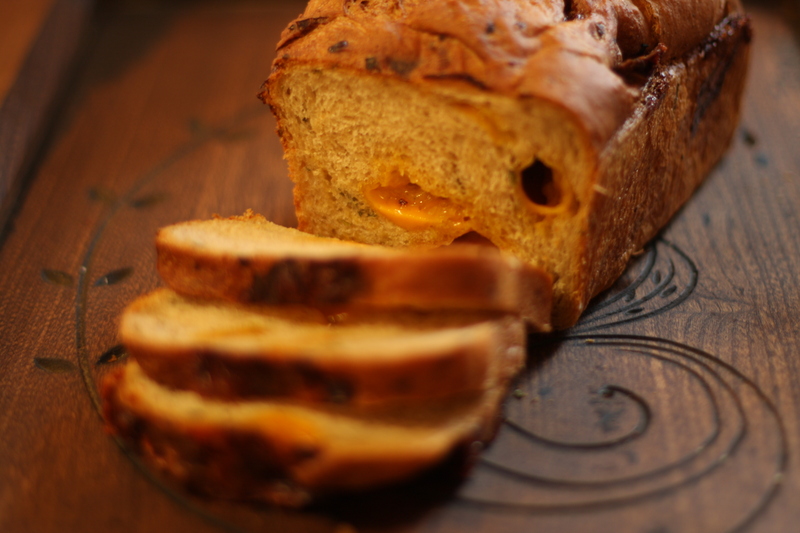 The bread selection includes a number of variations, including highly addictive flavours like Jensen cheese, rosemary and olive, date and pecan, and beer, onion and cheddar with a soft cheesey core (pictured). Cake and Loaf will also have macarons and mini cheese cakes at certain times (cookies and cream and rhubarb macarons pictured). Peanut butter and chocolate as well as a maple pecan mini cheesecake. If you are interested in a cake to shared with friends and family and for a special event, check out Cake and Loaf’s cakes. They can make a custom cake to suit your needs! Their vegan products are also very delicious! Indeed! I don’t think I’ve ever had a “meh” product from C&L. Always something new and delicious! They also do have gluten free products, just keep in mind that the bakery itself is not a gluten free facility.